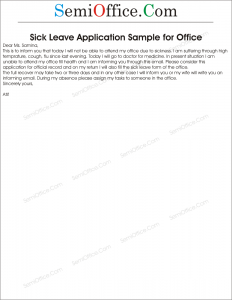 Sample leave application due to chicken pox on body or sickness due to chicken pox. Respectfully it is stated that I have contracted chicken pox and I have severe itching on my all body with high fever because of which I will not be able to attend school for some days. My family Doctor has advised me rest for a week and to avoid sitting with my class fellows so that they do not contract the disease. My medical certificate is attached herewith for your kind consideration. It is therefore requested to kindly grant me a sick leave w.e.f 15.10.2015 to 22.10.2015. I shall be very thankful to you for this act of kindness. With due respect, I want to say that I am suffering from chicken pox. And they are known to be a highly contagious disease. And secondly, the doctor has also advised me to have complete rest. So, please grant me a leave for a few days. I shall be very thankful to you. I am very sorry to inform you that I have fallen ill. Medical reports have confirmed that I am sick with chicken pox. It’s a viral disease and has contagious characteristics. I have been prescribed a full bed rest. Also, I have been advised to avoid human contact as it can expose others to the disease as well. Therefore, I am requesting for a sick leave of one week only. I can remotely work from home if urgently needed.